A good way to make use of fresh Spring vegetables and herbs. Make a trip to your local farmer's market this weekend. 1) In large saucepan on medium-high heat, add 2 tbsp. olive oil and chopped onion. Saute a few minutes. Add squash and zucchini and sauté until vegetables are tender. 2) Add garlic and spices and then mushtrooms and sauté a few more minutes. 3) Add crushed tomatoes and water and 2 more tbsp. of olive oil. 4) Reduce heat and simmer about 15 minutes. Add fresh basil a minute or two before serving. 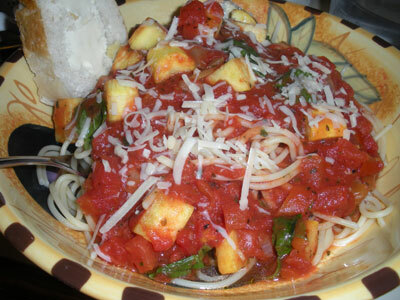 5) Serve with your favorite pasta and Parmesan/Romano cheese, if desired. Makes enough sauce for four servings.